What is a woman BEYOND compare??? 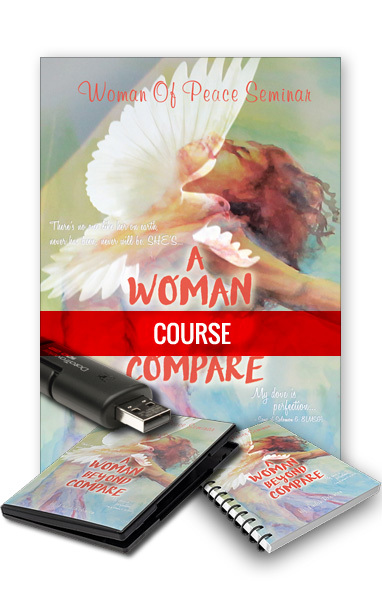 As women we often find ourselves on the treadmill of comparison … our self esteem challenged by different interpretations of perfection and expectation. We measure our worth through the eyes of the world, media, culture, men, other woman, parents, siblings and even religious beliefs. However there is One who has a dream for us and whose plumbline of value supersedes that of mankind. There is One to whom our lives play out, who looks through eyes of amazing grace and love! There is One Alone who has the ability and heart to lovingly craft us into the women we are meant to be – A Woman Beyond Compare. I believe the whole universe is on tiptoe waiting expectantly for this woman to come into view. I believe there is an urging in the spirit to allow this image of true womanhood to emerge. The question is … will you respond? Are you prepared to submit to the Lover of your soul, allow Him to overshadow you with His Presence and make you into the woman He designed you to be? This is a woman who celebrates and walks in her uniqueness and God given identity so that she can take her place in the great company of women who display the beauty of their King and prepare the way for His coming. We invite you to join us as together WE unveil what it means to be A WOMAN BEYOND COMPARE. Presentation format may vary from church to church. Having “Dove’s Eyes” -seeing yourself as god sees you. Going through the 8 Chapters (Change Rooms) of Song of Songs – Understanding the changes required to become The Bride of Christ. Once you have been trained, a starter pack can be purchased to present the seminar. The starter pack consists of 4 seminar DVDs, participant’s manuals and 1 facilitator’s manual. You do have the option of buying the DVDs separately. Extra manuals can be ordered as and when required. NB: The DVDs are not sold to individuals and may only be viewed by attending a seminar presented by the local church with a trained facilitator.